In attendance were: Lachlan Crescent, Su Dolphin, Illuminada Silver Trumpet, Marion Coral, Damien Sable Fret, Aubray Brangwyne, Thomas Quatrefoil, Maela Caimbeul, Hrorek Chevron, Roderick der Gelehrte and Cormac Mór. Upcoming meetings are: April 1, 2007; May 6, 2007; June 24, 2007. The April meeting is the last meeting prior to Crown Tournament, and thus the last opportunity for participants in the tournament to make submissions to be in compliance with the Kingdom's law that they must have a name and device registered or in submission. Also, this meeting is the last one where the older forms will be accepted. The November 2006 LoAR was discussed. Cover Letter items included a thorough discussion of the heraldic charges known as "panthers", "Continental panthers" and "Natural panthers" (now generally referred to as "ounces"). CD's are now provided between the various types of panther. Also, Wreath proposed a number of changes to RfS covering what is and is not a "step from period practice" in armory submissions. The Caid College of Heralds is looking for an exchequer. While Altan Gal is doing an admirable job, he is asking for an opportunity to retire from that position soon. 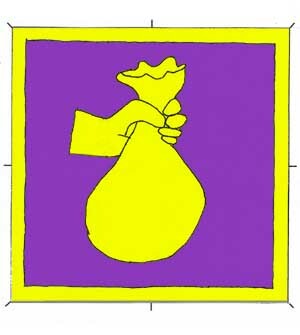 The KWHSS event steward is looking for a "goodie bag" coordinator. This month the College celebrates Saint Patrick's Day by not ruling on any Irish Gaelic names! Unless otherwise noted, all submitters will accept the creation of a holding name, if appropriate. Approved submissions will be forwarded on the March 21, 2007 Letter of Intent. Robin FitzOsbern. New device. Sable, a panther's head erased within an annulet within an orle Or. [Name] Submitter's name was forwarded on the January 24, 2007 Letter of Intent. [Armory] This device is returned for redraw. RfS VII.3 reads in part, "Identifiable elements may be rendered unidentifiable by significant reduction in size." This is the case with the annulet and especially the orle in this submission. In order to be registerable, the annulet and orle should be drawn at least twice as thick as they are here. The submitter specified that he desires a single tressure. A tressure is the diminutive of an orle. Under "Diminutive" the Glossary of Terms of the SCA College of Arms specifies, "SCA armory does not use single diminutives of charges, as they were considered artistic variants of the single ordinary in period." 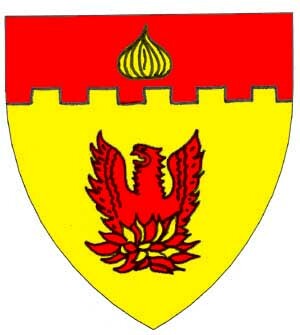 Aubray Brangwyne de Vitré. Kingdom resubmission name. [Name] The submitter is interested in a feminine name, will accept all changes, and if changes must be made, is most interested in the sound. She also will accept dropping "de Vitré" if necessary to register the name. Aubray according to Talen Gwyneck, is a feminine name. Bardsley p. 68 cites: "Robertus Ley, Aubray uxor ejus" (which we translate in to English as, "Robery Ley and his wife Aubray"), 1379 (from P.T. Yorks, p. 44). 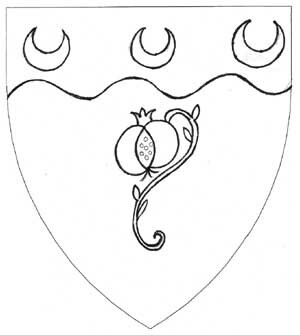 Brangwyne, the submitter cites "Feminine Given Names in a Dictionary of English Surnames" by Talan Gwynek (http://www.sca.org/heraldry/laurel/reaneyintro.html). The name is dated in this spelling to 1283 in R&W (pg. 61, s.m. Bragwin), it is used as an English surname (Adam Brangwyne from the Subsidy Rolls of Suffolk). We also found variants in Morgan & Morgan (s.n. Branhwyn) and Bardsley (s.n. Brandwin). de Vitré "of Vitre", a town in Brittany found in CLG (pg. 2041, header) The cite of a 14th-15th century castle. 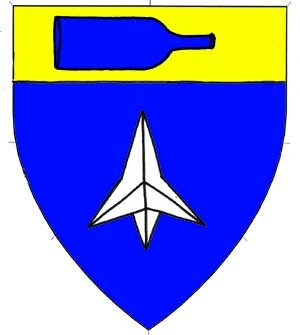 The submitter's previous name submission Brangwyne Scrivener de Vitré, considered at the 01/07 Caid College of Heralds meeting is withdrawn by the submitter. [Name] The branch name was registered "at some point" no later than 01/79. The submission is accompanied by a letter of support signed by baroness, baron, seneschal, exchequer and the consulting herald. 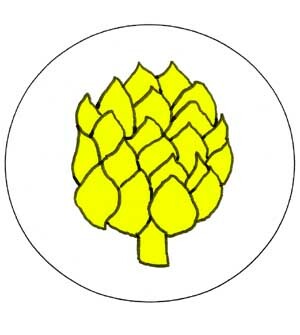 While not specified on the submission form, the letter of support specifies this badge is for use of the "Ransomer's Guild". No submission fee was received for this submission and must be returned for this reason. This was conflict checked, and no conflicts were found. Badge returned for lack of funds. [Name] Submitter's name was registered 12/05. [Armory] The submitter's previous submission, Per bend sinister enarched sable and gules, a bend sinister enarched argent papellony sable,was returned by Crescent 01/07 for redraw of the papellony treatment. 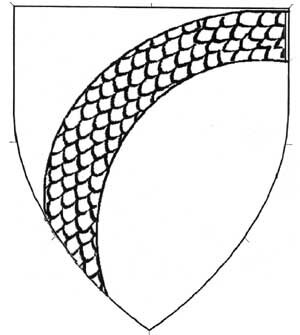 This emblazon has a clearly-drawn scaly treatment. 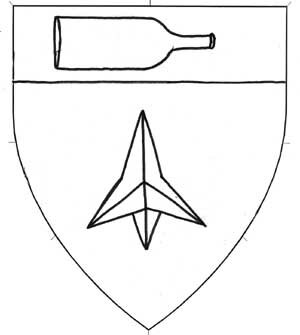 Considering potential conflict Per bend sinister sable and gules, a bend sinister between two candles argent (Lodhver Ledhrfótr, 11/95), we note that enarching a bend is not worth a Clear Difference because it is an artistic variant of a plain bend. 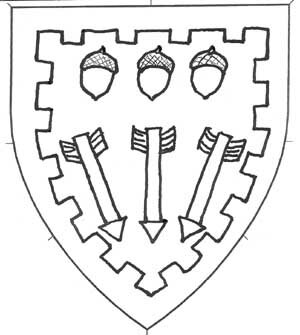 However, RFS X.4.a states "Field treatments are considered an aspect of tincture, so Per fess gules and argent has one clear difference from Per fess gules and argent masoned sable." Therefore, this design is clear with one CD for change in tincture of the bend and one CD for removal of the secondary charges. Samim Ayn al-hayāt. New Name. [Name] Submitter is interested in an authentic feminine Persian name, will accept all changes and if her name must be changed is most interested in 1. sound, 2. meaning (unspecified), 3. language/culture and 4. spelling. Samim is found in the listing of feminine names on p. 323 of Salahuddin Ahmed's A Dictionary of Muslim Names, (©1999), also Samina, both undated. Unfortunately, the submitter did not provide copies of this source. The College does not have this volume for us to verify the research. Ayn al-hayāt is found on p. 49 of Annemarie Schimmel's Islamic Names, (©1989). [Armory] No conflicts found. We note that recent LoARs indicate that mullets and caltrops have a significant, though not substantial difference between them. Alice la Sage. Kingdom resubmission name. [Name] Submitted as Alice le Sage, the submitter is interested in a feminine name. No other boxes are checked. Alice is found as a feminine given name (Withycombe, pg. 15, header), dated to 1273.
la Sage is a feminine epithet. We note the masculine form of the epithet le Sage (Reaney & Wilson, pg. 388, s.n. Sage) dates to 1185, with the meaning of "wise". We have changed le to la to match the gender of the name. [Name] Submitter is interested in a masculine name. No other boxes are checked. Douglas is found in Withycombe p. 88, "used in 16th century". of Kent is an English county. The Canturbury Guide (http://www.canterburyguide.co.uk/) tells us, "Ethelbert, King of Kent, granted land outside the city walls to build a monastery, and in 598 work began on what is now the oldest monastic site in Britain". This indicates that the name "Kent" was used in period. 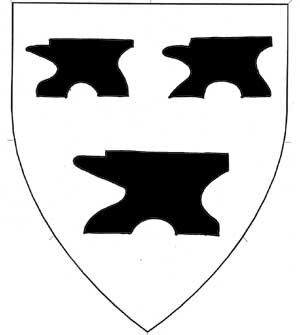 [Armory] Considering the potential conflict, Argent, a single horned anvil reversed sable enflamed proper, (Richard of Black Iron, 07/89, Caid): Previous precedent has ruled that addition of "significant flames" can create a clear difference (Magnus Jager, 11/00). We assume that the removal of significant flames is also a CD. 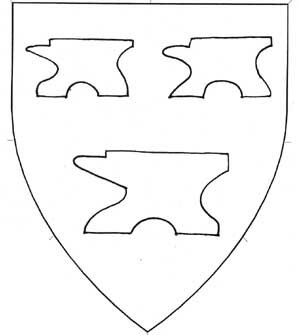 Upon viewing Richard of Black Iron's badge, we see that these flames are significant, even to the point that it might be reasonable to view them as the primary charge and the anvil a tertiary charge (A more precise blazon might be, Argent, on a flame Or fimbriated gules, a single horned anvil reversed sable). Given this, there is a CD for change in number of anvils and another CD for removal of significant flames. Aurora Cecilia da Castel di Sangro. Kingdom resubmission name. [Name] Submitted as Auròra Cecilia da Castèlli de Sangro. Submitter is interested in a feminine name and will accept minor but not major changes. No other preferences are indicated. Her previous name submission Aurora Cecilia Iacobucci was returned by Crescent 02/05 because "Iacobucci" was an undated variation. As greater than one year has elapsed since the previous return, a new submission fee is required by the Caidan College. Unfortunately, this was received at Estrella and no funds accompanied this submission. Aurora is found on p. 82 of De Felice 'Nomi'. We believe the text indicates that the name was in use in our period. "F. Ampiamente diffusio in tutta l'Italia, è un nome affettivo e augurale medievale formato da aurora..."
Cecilia is found on p. 103 of De Felice 'Nomi', The name is undoubtedly period. De Felice says, "largamente diffuso in tutta liItalia, con alta compattezza in Lombardia, è un nome cristiano insorto con il culto de Santa Cecilia…"
de Sangro is found on p. 1067 of "Webster's New Geographical Dictionary" as a river in Italy. Accent marks in De Felice are used as pronunciation guides and are not part of the original spelling. We have removed the accent marks to match the documentation. We were concerned about the grammar of the original surname. The College found that "Castel di Sangro" is a town in South Central Italy according to CLG p. 344. The city's website, http://www.comune.casteldisangro.aq.it/storia.htm, indicates that there was a Convento della Maddalena (1400) which indicates that the town has been there since at least 1400. We have changed the name to match the documentation. Unfortunately, this resubmission was not accompanied by the appropriate funds, so must be returned. Name returned for lack of funds. [Name] Submitted as Diana Reynard la Rouge, Submitter is interested in a feminine name, will accept minor but not major changes, and if changes must be made cares most about the unspecified meaning. Diana is the submitter's legal name (copy of driver's license attached) and is also found on p. 83 of Withycombe under Diana, which cites Diana Lutrell born 1580. Reynard is found on p. 844 and 845 of Marie-Therese Morlet, Dictionnaire Etymologique des Noms de Famille. It is also found in R&W (p. 376, header spelling), includes Elias Reynardi dtd to 1205 and Henry Renard 1325. The submitted spelling is an acceptable variant. la rouge is also found in Mórlet on p. 865 as Rouge or Lerouge, this name was changed to indicate a descriptive byname, "the red". 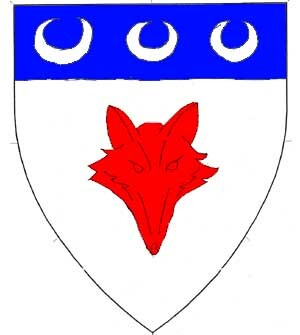 [Armory] This is clear of Argent, a fox's head erased gules on a chief azure two swords in saltire argent. 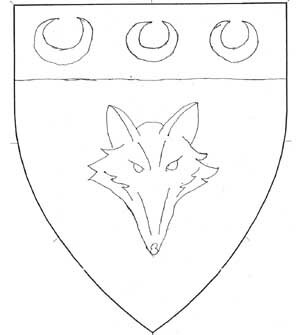 (Helen Jennet of Foxhall, 07/88) with one Clear Difference via X.4.h for change in posture of the fox's head and a second CD via X.4.j for changes to the charges on the chief. 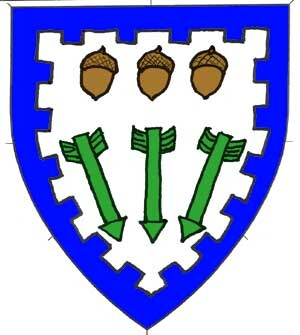 It is also clear of Argent, a fox's mask proper on a chief triangular azure three daisies Or seeded sable (Susan of Foxmeadow, 10/98) with one CD via X.4.e for change to the shape of the chief and another via X.4.j for changes to the charges on the chief. Name approved as changed and forwarded to Laurel, Device approved and forwarded to Laurel. [Armory] If this submission is registered, the submitter wishes to release his previous device Per chevron wavy argent and vert, two trees proper and two axes crossed in saltire Or hafted proper. (Registered 04/06). 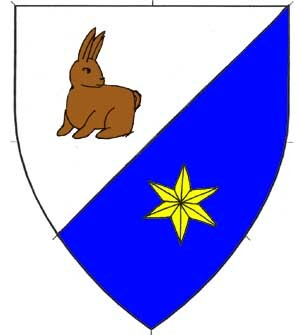 The submitter specifically requests the blazon term "bolt". We note no previous registration of the term unmodified, but two registrations of the term "crossbow bolt" (as opposed to the more common "quarrel"). We note (with some humor) that the OED (pg. 975, definition I.1) states, "An arrow...called also quarrel, discharged from a cross-bow or other engine. Often fig. esp. in the proverbial phrase A fool's bolt is soon shot, so common from the 13th to 18th c."
[Name] Submitter's name was registered 03/04. [Armory] The submitter's previous submission, Or, a phoenix gules rising from flame proper within a bordure rayonny gules semy of onions Or was returned by Crescent 06/06 for redraw. We note that this simplified design has helped a great deal. The flames here have a few Or tongues mixed amongst many gules ones such that no Or tongues lie upon the Or field. We believe this to be a valid depiction of flames proper, that conveniently avoids contrast problems, given one of the descriptions provided in the 04/95 cover letter, ("The only other decent written description I found was in Franklyn and Tanner, An Encyclopaedic Dictionary of Heraldry, p. 135: 'Often described as "proper" (q.v. ), may be either gules and Or or gules shaded Or.' No emblazon was given"). [Name] The submitter desires a feminine name and will accept all changes. If the name must be changed, the submitter cares most about the unspecified language/culture. The name also appears in Ekwall, pg. 323, header spelling Mereworth dated in various spellings to 843, 960, 1097, and 1322. Name and device are approved and forwarded to Laurel. Isabella de Mereworth. New badge. 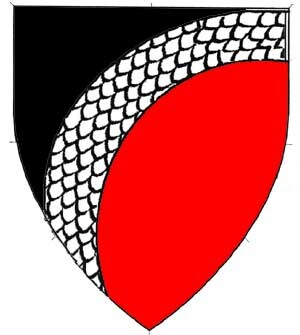 (Fieldless) On a dexter hand appaumy gules, a mullet of seven points voided and interlaced Or issuant from a goblet argent. [Armory] The use of a tertiary voided charge is not permitted, per RFS VIII.3 "Voiding and fimbriation may only be used with simple geometric charges placed in the center of the design." This submission is an excellent example of why that rule was written. The mullet is very hard to distinguish. 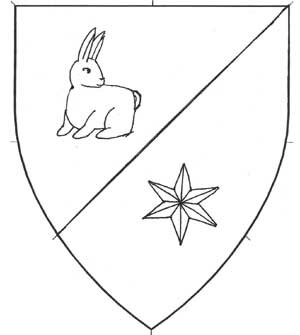 There was some discussion on whether or not this appears too close to the restricted charge known as, "the Red Hand of Ulster," described in the Glossary of Terms as "A sinister hand appaumy gules on argent canton or inescutcheon." 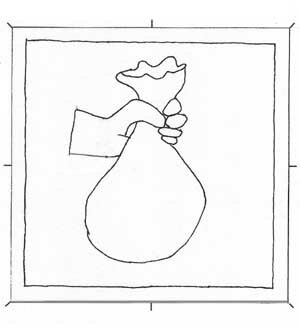 It is likely that the lack of an argent field and the addition of tertiary charges removes any pretence problem, but the submitter should be aware of the issue in order to avoid it upon resubmission. [Name] Submitter is interested in a feminine name, allows minor but not major changes, and if changes must be made, she cares most about unspecified language/culture. 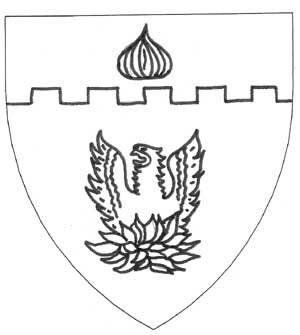 Litovka is dated to 1506 (Agaf'ia Litovka, serf of Talyzin) in Paul Wickenden of Thannet's "Dictionary of Period Russian Names" (http://www.sca.org/heraldry/paul/). [Armory] This submission is clear of SCA armory Per bend sinister argent and azure, a bear rampant to sinister sable and a mullet of eight points Or (Jocelyn de Biers, 01/89), by a change of type and tincture of half the primary charge group. Jacqueline de la Bere. New Device. Per pale argent sable two bears combatant, in chief a laurel branch fesswise all counterchanged. [Name] Forwarded on Caid's 11/22/06 Letter of Intent. 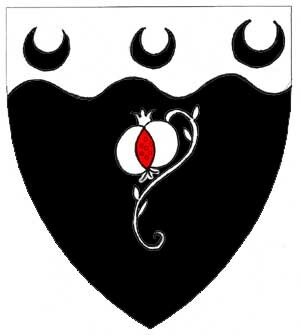 [Armory] This is returned for conflict with Per pale argent and sable, two bears statant erect respectant counterchanged collared gules (Adelhard Björnsson, 11/98). There is no Clear Difference via X.4.h between "statant erect respectant" and "rampant." RfS X.4.h says, "A change of posture must affect the orientation of the charge, or significantly change its appearance. Changes in the position of the head, for instance, are not significant, nor is the change from statant to passant, which essentially moves only one leg." Also, there is no CD for the removal of the visually insignificant collars. Thus there is only a single CD for addition of the charge in chief. The charge in chief was a bit difficult to blazon. It is clear that it is meant to be a laurel branch, but the leaves go opposite directions, suggesting two branches. We request that the submitter draw this clearly as either a single laurel branch or two distinctly separate branches (though not in the form of a wreath) upon resubmission. Matlens Litovka appears in the OP as "Matlens Litovka". Ahmed, Salahuddin. A Dictionary of Muslim Names. New York: New York University Press, 1994. Morlet, Marie-Thérèse. Étude D'Anthroponymie Picarde, Les Noms de Personne en Haute Picardie aux XIIIe, XIVe, Xve siècles. Amiens: Musée de Picardie, 1967. Wickenden of Thanet, Paul. A Dictionary of Period Russian Names. Mountain View, CA: SCA Inc. – Free Trumpet Press West, 3rd ed. 2001.